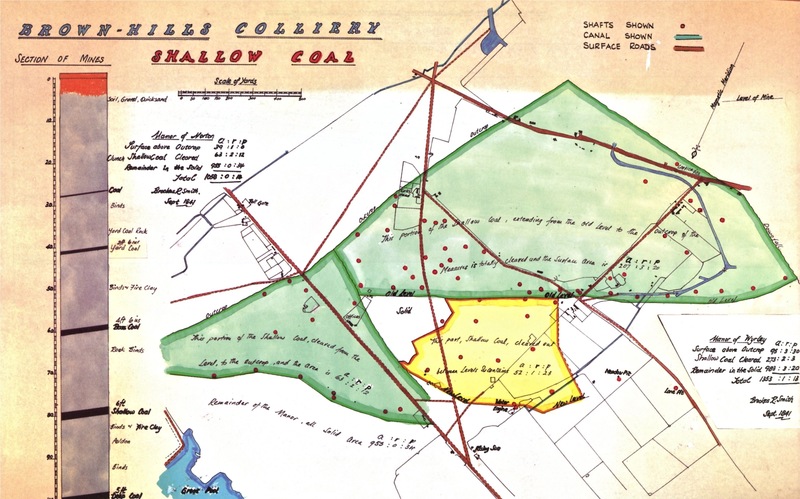 Continuing the trawling of material relating to mining on Brownhills Common and the origins of Engine Lane, I happened upon a collection of survey plans in the excellent book ‘Coal Mining in Walsall Wood, Brownhills and Aldridge’ by Brian Rollins and Walsall Local History Centre. These are a remarkable set of historical documents, but it took me a while to get my head around them. I present just one here, as that’s enough to illustrate the point. I’ve two versions, the original, as scanned from the book, and a second, rotated and annotated to make sense. They were created by Brookes R. Smith – presumably a surveyor or valuer – and dated September 1841. They almost look like someone’s geography homework. I’m utterly captivated by them. Do study the notes of the draftsman, they’re remarkable. This is a remarkable document - but it's not easy to understand, and is diagramatic rather than to scale. It was clearly made for use by financial people, not engineers. Taken from 'Coal Mining in Walsall Wood, Brownhills and Aldridge' by Brian Rollins & Walsall Local History Centre. Click for a larger version. You may want to download and save it. The plan here is rotated with North upwards (note the poor allignment of Noth on the original drawing. Every red dot represents a shallow mine. Note the 'Water Engine' in the region of the Cathedral Pit; this is dated 1841. Click for a larger version. You can download a .PDF copy of the annotated version by clicking here – it’s 11.2MB in size, so could take a while to download, but it’s better quality than the one above. The water engine marked south of the Rising Sun caught my interest, as did the Offices on Watling Street and Turks Head – a pub later superseded by the Hussey Arms, named after Phineas Fowke Hussey, Lord of the Manor and owner of the coalfield. Mr. Harrison sank the Cathedral Pit in the Rising Sun Trough and this later became the location of the main pumping arrangement. It superseded what is known as the New Engine (?) on the plan of Brookes R. Smith of 1841 (the drawing above) which was situated at shafts behind the Rising Sun. 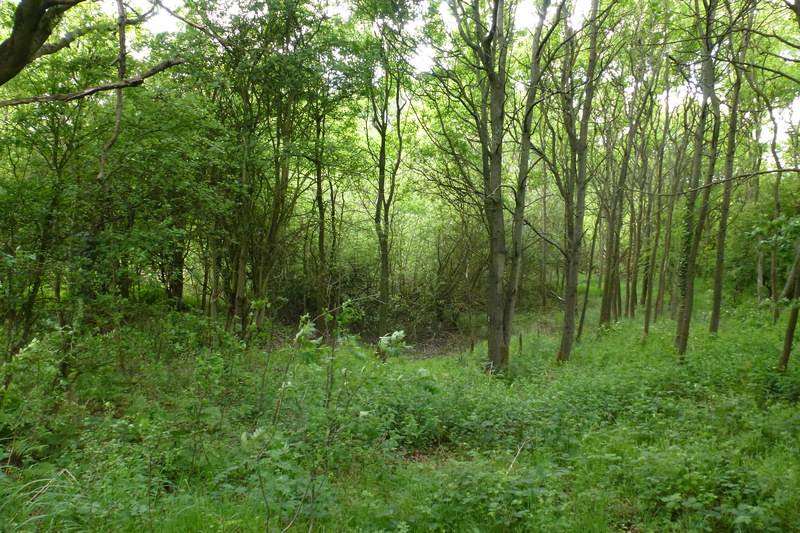 The Sun Pit and Hart Pit were also sunk about this time and were later followed by the three shafts of the Wyrley Common Colliery, called the Red, White and Blue. All this took place in the Manor of Wyrley. In the same vicinity, but in the Manor of Norton, Conduit No. 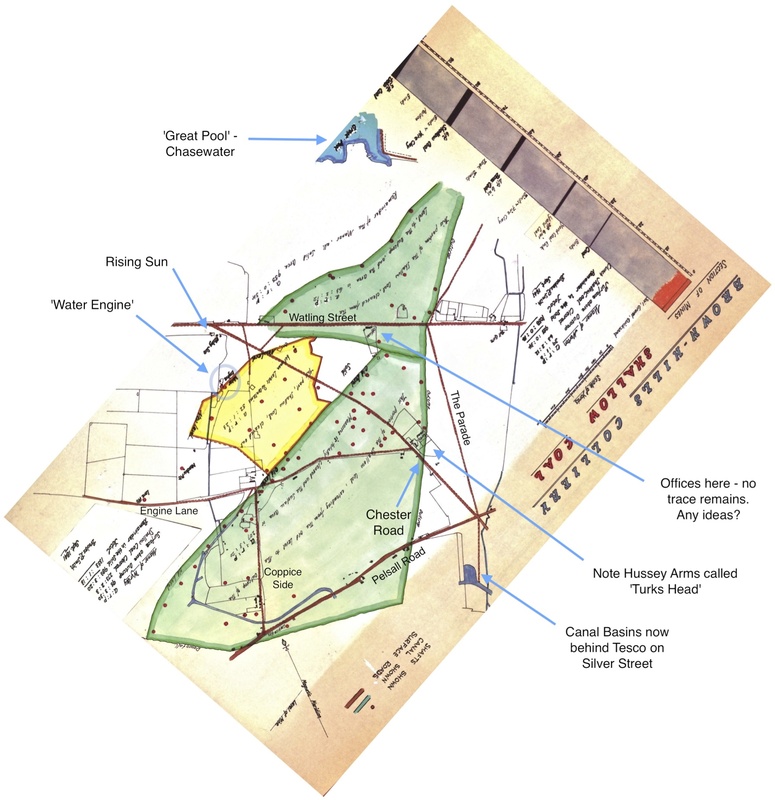 1 was developed on the south side of the Watling Street, later followed by other Conduit Pits in a north-westerly direction. I’m now confused. Stuff I thought I knew is wrong, and everything I seem to read leads in different directions, but it’s all absolutely fascinating. If anyone has more to add, please do so. This is easily the most involving, detailed stuff I’ve done on the Brownhills Blog. I feel like Tamworth Time Hikes, but where is Lorenzo when you need him? No trace found - but it doesn't mean an engine wasn't here. Something was. 5:43pm, Saturday, 21st May 2011. As a side issue, I popped up to the common yesterday to investigate the position of the enclosure marked on the 1884 map that David Fellows feels may have been a pump house. I can’t find any trace, but that doesn’t mean it’s not there, or that I think he’s wrong. My next step will be to generate a Google Earth overlay of the relevant OS maps which can be loaded into a Garmin GPS, and then go hunting. Stay tuned. This entry was posted in Brownhills stuff, Chasewater, Environment, Followups, Fun stuff to see and do, Interesting photos, Local Blogs, Local History, Local media, Reader enquiries, Shared media, Shared memories, Social Media, Spotted whilst browsing the web, Walsall community and tagged Brookes R Smith, Brownhills, Brownhills common, Brownhills local history, Brownhills Past, Brownhlls coal mines, Cathedral Pit, Chasewater, Coppice Colliery CO., Coppice Pit, David Fellows, Derelict, Engine, Engine Lane, local blogs, Local History, mining in brownhills, New Photos, Old maps, Ordnance Survey, Pump, Reservoir, Staffordshire, Steam pump, West Colliery, William Harrison. Bookmark the permalink. The maps ..a.r.p. acres, poles and roods? In this metric age this may need explaining . Can you help? I walked along this old lane just once ,over thirty years ago..there was a battered old bridge over an old canal..still there at all? page 112 shows a map showing the route taken by the Norton Branch of the South Staffs Railway at its opening in 1858, and a part register of the plots listed, taken from the “Parish of Norton Canes ” land register. Sadly this is incomplete…Engine Lane is shown…and an oblong structure, numbered 42 along the Lane. I wonder if this is the supposed “Engine House” in fact. Sadly Mr Reece only includes listings up to number 33 on the plan…..the register may have given a description of the premises, its owner and its lessee! Page 74 shows the 1841 census details for those who worked there at that time. D.Evans, fan of Petula Clark! I will follow your search with interest as I tried a similar search for an old brick works on the Colton Hills, that closed in around 1910.
the colour plan you feature was kindly displayed by Brian Rollins with many other interesting local mining memorabilia items of his during one of the lecture evenings held at Brownhills Community Room. I think that this was also the evening when Gilbert Rowley recounted some of his personal experiences of being a miner down the Walsall Wood Coppy Pit. One of the local toll gates is shown on the plan, along the Watling Street. I wonder if this was close to the Knaves Castle, or by Knaves Castle house/shop there? It would be interesting to be able to locate all of the tollgates . One of the “photo” books of Brownhills shows the tollhouse on Brownhills High Street, by the Anchor pub. Pouk Lane, Hilton has a “Tollgate ” cottage… the main Lichfield Road from Walsall (Butts) to Muckley Corner was similarly a Turnpike Road in the 1850..Where were the tollgates , I wonder? ..if only the camerman had looked behind him..there may have been an equally important photo to take……Who knows, perhaps he did! I wonder if Mr Mayo has got a copy! The website does not quote any sources !! Many years ago my father pointed out to me a row of bricks that he said were the remains of the tollkeeper’s house on Watling Street. They are covered up now, but the location is easily found. Going west from Howdles Lane it is in front of the first bungalow with access to the Watling Street at back of pavement. Presumably, there was some structure on the south side of the road, but this would have been obliterated by dualling in about 1970/71. The 1814-1817 mapping shows other tollgates on the (now) A461 at Walsall, somewhere near where Borneo Street is now, Rushall and Pipe Hill south of Fosseway Lane. From: ‘Townships: Wall with Pipehill’, A History of the County of Stafford: Volume 14: Lichfield (1990), pp. 283-294. URL: http://www.british-history.ac.uk/report.aspx?compid=42364 Date accessed: 24 May 2011. However, there is still a “Tollgate Cottage” in about the right place. Please extend my thanks to Andy Dennis for his research and fascinating information concerning the Tollgates hereabouts. I wonder if the Muckley Toll was beside the canal ? with best wishes…and thanks, Andy! Google Earth streetview camera shows the spot mentioned by Andy Dennis..the Brownhills Watling Street Tollgate site. Hi there, I am wondering if you can help. I am trying to find a map or some kind of layout of the The Sinking/No. 3 mine where my Grandad worked. My son has a homework project and I need as much information or accounts of life there as possible. Could you point me in the right direction? It seems as though I am finding it difficult to sift through non related info. I cannot take my son to the cannock mueseum due to their odd opening hours. Much Thanks. Thanks for your links tho, I raided Brownhills Library yesterday. My only wish would be all this info in child friendly books. I’ll have to read through these as they would be hard going for a 7 year old. Many thanks!